At the Tokyo Motor Show the latest Honda CR-Z Hybrid concept has debuted along with news of a production debut at the 2010 Detroit Auto Show. Yes, the compact pocket-rocket will return, complete with a manual transmission. This is the second version of the Honda CRZ concept, but it's well on the way to being an actual production car which we'll see debuted at the 2010 Detoit Auto Show. The preternaturally lovable two-seater will be making a return by the fall of 2010 and hopefully make us remember why loved old Hondas so long ago. The CRZ is planned as another dedicated hybrid from Honda, but this time it'll get the twist of a six speed manual transmission. We're be particularly interested to see how that whole system will shake out when it goes from concept to production. Honda today debuted the much-anticipated CR-Z Concept 2009, the second concept version of the stylish, sporty hybrid coupe, at the 41st Tokyo Motor Show. While the vehicle displayed at the show is a global concept with a rear seat, the production version that will be introduced to North America in the second half of 2010 will be packaged as a sporty, 2-seat hybrid that provides a personal driving experience for North American customers. "The Honda CR-Z will expand our lineup of hybrid vehicles and reinforce the fun-to-drive values associated with the Honda brand," said Erik Berkman, vice president of Automobile Corporate Planning and Logistics for American Honda Motor Co., Inc. "Beyond great styling and features, CR-Z will bring new levels of engagement and fun to customers interested a small car or a hybrid vehicle." 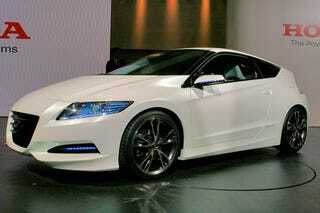 CR-Z will join the Insight and Civic Hybrid in the Honda hybrid lineup, each offering distinct benefits. Civic Hybrid, launched in 2003, was Honda's first mainstream model to feature hybrid power. The 2010 Insight, introduced in March 2009, ushered in a new era of affordability for a hybrid family sedan. The CR-Z will break new ground as a sporty, hybrid coupe with unique value.